This beautiful newly constructed (155m2) villa was conceived by its owner as a sanctuary of inner peace and well being, perfect for those looking for a quiet holiday haven overlooking the sea. It is located just a stone’s throw from the beach (150m) in Ftelia, which has one private beach club and two restaurants. 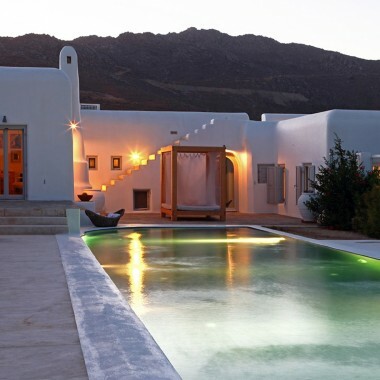 This unique location offers relaxation and tranquility while still being close to all the buzz of Mykonos town (7km), and only a 3 minute drive to the small village of Ano Mera with its local shopping and dining options. The beaches of Elia, Panormos and Agios. Sostis are just a 10-13minute drive away. The villa is on one acre of private grounds, within a four acre residential estate of four villas, and benefits from unobstructed sea and mountain views. The villa is on two floors with terraces at both levels. The ground level has a private infinity swimming pool, with surrounding terrace with areas for relaxing and dining outdoors. There are sun loungers by the pool and also an outdoor shower. On the first floor level there are spacious bedroom terraces furnished with outdoor sofas. Inside, the spacious and stylish open-plan living room, with dining area, is furnished with custom-made furniture and a striking wall sculpture. Floor-to-ceiling windows allow for plenty of light. The gourmet kitchen is very well equipped. All four bedrooms offer unobstructed panoramic sea or mountain views and have direct access to the pool or the upper level terraces and patio. The master bedroom and bathroom on the ground floor are wheelchair accessible. The living features an impressive home theatre with an HD projector, bluetooth powered BlueRay media player and Apple TV. Full device connectivity and content streaming through bluetooth and airplay, free USA NETFLIX access is also available in the master bedroom on the upper level. Further amenities include air conditioning and heating, and Wi-Fi in all rooms. The indoor gym (stationary bicycle, multifunction fitness machine) also has a massage bed, yoga mats and pilates equipment for outdoor exercise. An office desk has a fax, scanner and photocopier, and there are usb charger sockets in all rooms. There are slippers, gym and massage towels, designer bathrobe and pool/beach towels, and hairdryers. The property has a safe box and an alarm system..
Open-plan kitchen, fully equipped, including four ring cooker with oven, fridge, dishwasher, microwave, washing machine/tumble dryer, dolce gusto and pressed coffee makers, fruit juice extractor and toaster. Open-plan living and dining room. 1 master bedroom with queen size bed, en-suite bathroom (wheelchair accessible with toilet and shower support rails), sea and mountain view, and direct access to the terrace with beach views. Also on this level is an indoor gym and a guest WC. 1 master bedroom with queen size bed, en- suite bathroom (bathtub), sea and mountain view, and direct access to the upper level terrace. 1 bedroom with queen size bed, sea and mountain view, direct access to the upper level terrace. 1 bedroom with queen size bed, mountain view, direct access to the mountainside space. 1 shared bathroom. This stunning villa is a sanctuary of tranquillity and well being, perfect for those looking for a peaceful holiday overlooking the sea. It is located just 150m from Ftelia Beach and 7 kms from Mykonos town. It offers both sea and mountain views, great outdoor spaces, a wonderful swimming pool and a private gym, as well as many other amenities. Minimum stay in July and August is 7 nights. Outside these months, it is 5 nights.